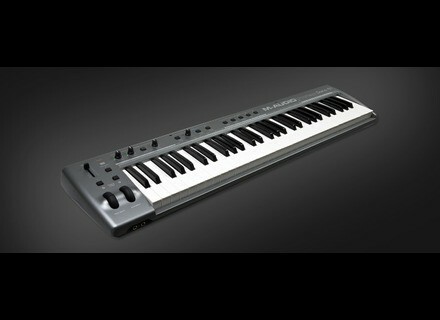 ProKeys Sono 61, MIDI + Audio Keyboard Controller from M-Audio in the ProKeys series. M-Audio announces the ProKeys Sono 61, a 61-Key Portable Digital Piano with Audio Interface. The ProKeys Sono 61 features semi-weighted action, five built-in sounds, 128 General MIDI sounds and an integrated 2 x 2 USB audio interface with dual headphone output. [Musikmesse] M-Audio Fast Track Ultra 8R M-Audio announces the Fast Track Ultra 8R, an 8 x 8 USB 2.0 Interface with 8 Preamps and MX Core DSP. [Musikmesse] Focusrite Liquid Mix 16 Musik Messe 2008 sees the launch of the Focusrite’s fourth Liquid solution, Liquid Mix 16. Starplugs THS Synthesizer MK 1 Starplugs has released the THS Synthesizer MK 1 which, they tell us, features the new Synthesis algorithm - the TransHarmonic Synthesis with the new developed THS Oscillator.